Despite his regal and majestic appearance, the Great Pyrenees is a keen worker, faithfully guarding his flocks no matter the weather or terrain. With his intelligence, scenting ability and excellent sight, he is an invaluable companion to the shepherd. The breed possesses a beautifully thick, weather resistant white coat that may contain markings of badger, gray, or various shades of tan. It is thought that the Great Pyrenees originated in Central Asia or Siberia and followed the Aryan migration into Europe. The breed takes his name from the mountain range in southwestern Europe, where they are used to guard flocks on the steep slopes. In addition to its association with the peasant shepherd, the Great Pyrenees was also cherished by the nobility and appointed French court dog in the 17th century. 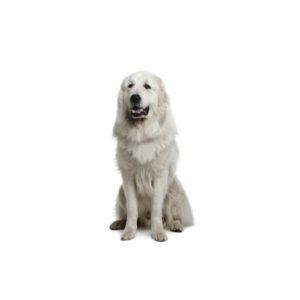 While affectionate with his family and quiet and tolerant in general, if there is something to guard or protect, the Great Pyrenees can become quite territorial. Because they were bred to work independently and make decisions on their own, Pyrs may not be the star of the local obedience class. The breed should be exercised daily on leash or in a fenced area. New owners should be prepared for barking, especially at night, and brushing approximately once per week. Working Group; AKC recognized in 1933. Ranging in size from 25 to 32 inches tall at the shoulder. Thrive in moderate to cool climates. Average shedding, heavy seasonal shedding. Are you interested in purchasing a Great Pyrenees? By clicking “yes,” I authorize Petland Naperville and Third Party Pet to deliver or cause to be delivered telemarketing text messages using an automatic telephone dialing system. I acknowledge I am not required to sign the agreement (directly or indirectly), or agree to enter into such an agreement as a condition of purchasing any property, goods, or services. I may opt out of text messages at any time by texting "STOP". Standard message rates apply. 5.0 10 based on 10 ratings. Schedule an appointment today and receive a $400 discount on your puppy!